Next Learn-to-Fly Beginners Course - When Ever You Are Ready! See what it's like to go for a flight with Richie McCaw! We're looking for potential new pilots to take part in our Learn-to-Fly course. The next course will start as soon as you are ready! We have decided to run one-on-one training, where you will be allocated an experienced Instructor who will work directly with you. Typically the basic training takes about 6 days of flying and consists of combined theory and practical flying. As well as learning how to take off, fly and land the glider safely, students cover topics such as weather, radio usage, and ground handling of the gliders. The goal of the course is to have students ready to safely complete a solo flight without an instructor sitting in the back seat. Our club is non commercial, with instructors volunteering their time to keep costs to a minimum. 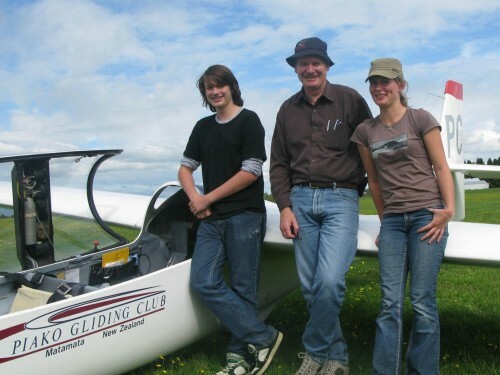 The training course is just the beginning for pilots, who can go on to fly cross country, take passengers, learn glider aerobatics, or enter gliding competitions. The course costs are TBD, plus flying costs, which are approximately $120 per flying day. Ideal age range is 16 - 55. Weight limits for pilots are 50 to 110 kg. If you're intersted in participating in a course, email training@glidingmatamata.co.nz. Aimee after completing her first solo flight without an instructor in the back seat!